Cinnamon Caramella Cappuccino - A recipe from Savor California, the online showcase for extraordinary gourmet foods and beverages from California. Add 2-ounce shot of espresso into a coffee mug. Stir in both syrups. 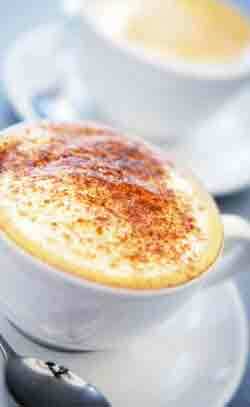 Pour frothed milk into the espresso/syrup mix and top with whipped cream. Drizzle with caramel sauce or sprinkle with cinnamon.